For years now I have wanted to host a Hawaiian Luau Party and this year I’m doing it 🙂 and I’m so excited! Now that I’ve got myself into this I’ve got to come up with the some Hawaiian Style foods. I will admit that I’m notorious for making something new for dinner guests, but this time I’m planning ahead and testing (and re-testing) everything. I’ve been working on these recipes for the past month now trying to narrow it down and get the menu just right and I think I’m finally there. 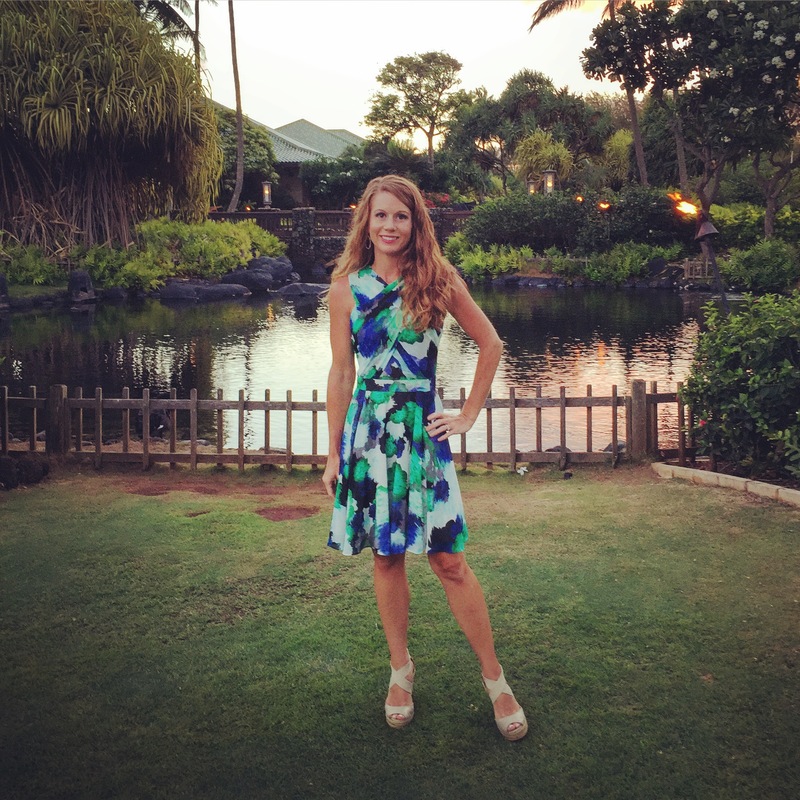 So for the next week I’ll be sharing my “Mainlander” take on Hawaiian foods and cocktails to serve for a Hawaiian Luau Party. I will admit that I love traditional Hawaiian luau foods like lomi lomi salmon and Hawaiian Poke (the most delicious of raw ahi tuna dishes) but since most of my guests don’t really care for seafood I’m skipping out on these dishes. Instead I will be sharing my recipes for things like Smoked Kalua Pork, Hawaiian Style Smoked Ribs, Huli-Huli Grilled Chicken skewers, Hawaiian Style Macaroni Salad, Toasted Coconut Lime Rice Pilaf, Tropical Carrot Slaw, Hawaiian BBQ Baked Beans, Tomatoes With “Hot Lava Salt” and something special for dessert… I’ll keep that as a surprise for now. 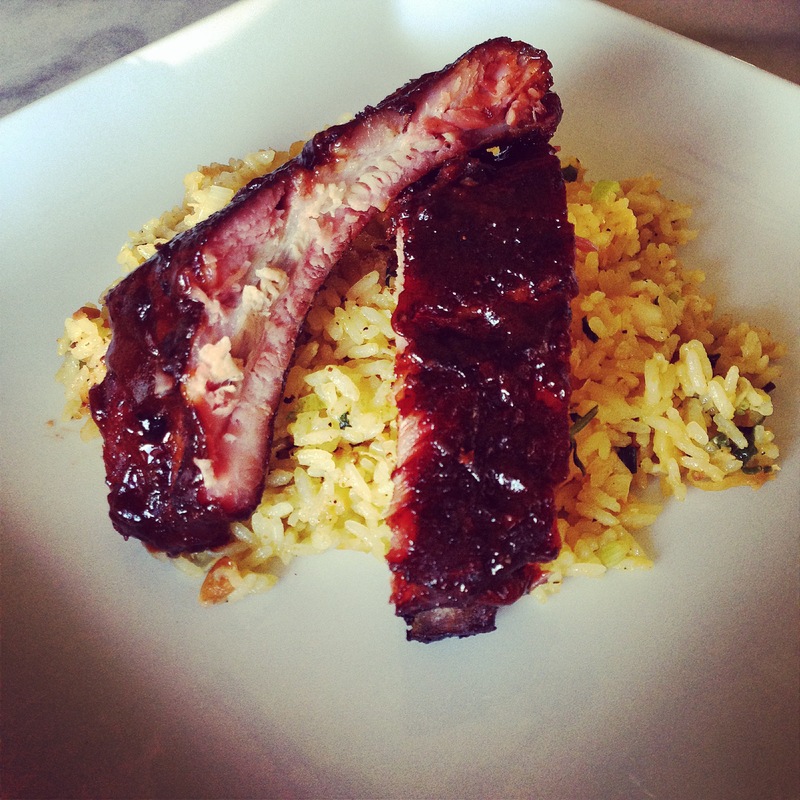 The first of my Hawaiian Luau recipes I wanted to share with you is these Hawaiian Style Smoked Pork Ribs and Toasted Coconut Lime Rice Pilaf. Whisk together all the dry rub ingredients in a small bowl. Remove the silver skin from the back of the pork ribs. 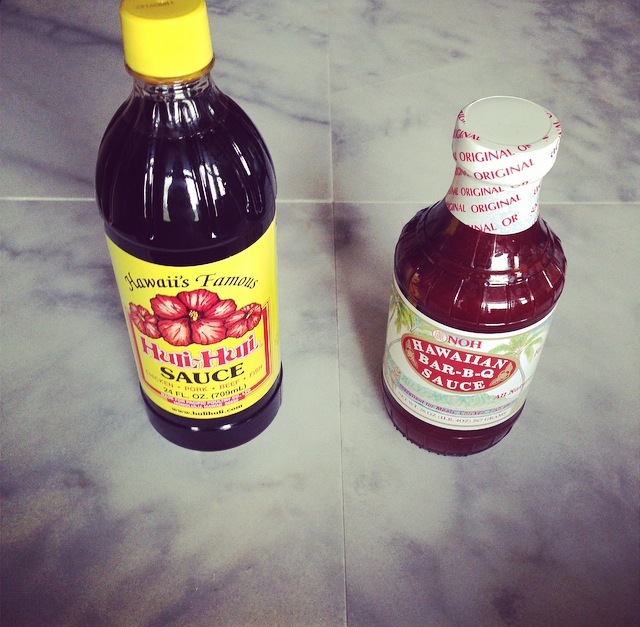 Then moisten the ribs with the Huli Huli Sauce, about 1½ Tablespoons per side. Then liberally season the ribs with the dry rub. Wrap the ribs in plastic wrap and refrigerate over night. Remove the ribs from the refrigerator 1 hour before putting them on the smoker and allow them to come up to room temperature. 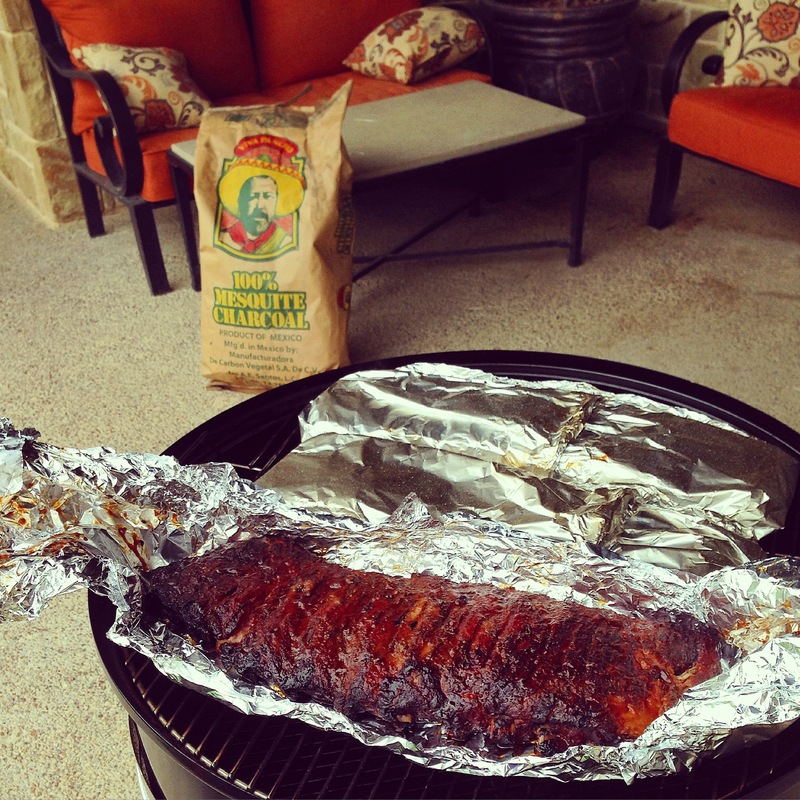 Prep your smoker according to you manufactures directions (as all smokers vary). Remove the plastic wrap and smoke the ribs between 225-250 for 4-5 hours until they are just about to fall off the bone. Then remove the ribs and baste in 1 cup of Hawaiian BBQ sauce mixed with ¼ Cup Pineapple Juice. Wrap the ribs tightly in foil and put back on the smoker for 1 more hour. Then remove from the smoker and allow the meat to rest for at least 20 minutes. This Toasted Coconut Lime Rice Pilaf is hits all those flavor notes that I love… Salty, sweet, tangy, crunchy and although it’s not traditional Hawaiian Steamed Rice it make me think of Hawaii. In a medium-sized saucepan bring the Coconut Water, Stock, and Soy Sauce to a boil. Once the liquid is almost to a boil, melt the butter in a large pot over medium-low. Then toast the rice and orzo pasta until opaque and it smells nutty, about 2 minutes, stirring constantly. Carefully pour the boiling liquid into the toasted rice and stir in the lime juice, and garlic. Cover and simmer for 17-20 minutes. Meanwhile add the slivered almonds and toasted coconut to a dry sheet pan in a single layer. Toast in the oven until golden brown, for 15-20 minutes, checking every so often and tossing for even browning. Once the rice is cooked, fluff with a fork and allow it to sit for 2-3 minutes. Then toss in the chopped green onion, cilantro, lime zest, and the toasted coconut and slivered almonds. Looks sooo delicious! Not the best timing to be reading this post before bed! 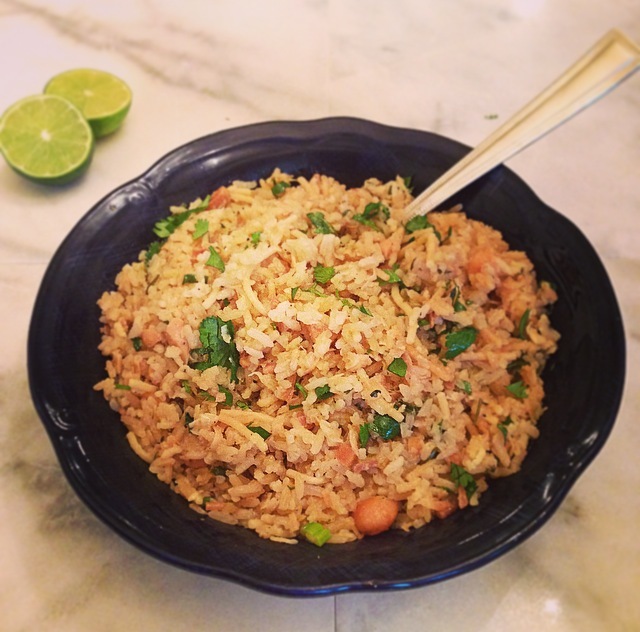 This looks so so good, great recipe for the pilaf rice! That way I can get some other pic’s of the party. Mmmm….I love the sound of this, especially the rice, what a great twist on the traditional rice pilaf! ☺️ I’m glad y’all like them they are one of my favorites too!! Thanks for the feed back Jen!! Enjoy the rest of the week! !